This week, I (Dear Darling Spouse), have the honor of ghost writing for The Thirsty Kitten as My One And Only is due a well deserved break from scribe duties. And this week, we’d like to take you once again to our beloved Anderson Valley (henceforth referred to simply as “The Valley”)—our home away from home in Northern California’s Mendocino County. If you know us well enough by now, you know that we have a soft spot in our hearts, noses and palates for The Valley and all of its abundance and treasures. The particular Treasure of The Valley about which we’d like to tell you today is Breggo Cellars. Interestingly, we first discovered Breggo not on one of our many trips to The Valley, but right here at home in Minnesota, on a spontaneous mid-week Date Night at one of our favorite local restaurants, Biella. Just down the road from us, Biella is located in the small town of Excelsior, whose claim to fame is having been a concert stop on The Rolling Stones first U.S. tour in 1964. According to legend, a townsperson named Mr. Jimmy was at the local drugstore soda fountain when he ran into a young Mick Jagger the day after The Stones’ performance. When Mr. Jimmy was given a regular Coke instead of the Cherry Coke he ordered, he supposedly turned to Jagger and uttered with disappointment, “You can’t always get what you want.” This little aside is offered for those of you outside the Twin Cities who may not know this charming legend about The Stones’ famous song. Excelsior’s main street, which still seems as quaint as it must have been when Mr. Jimmy met Mick, is where Biella makes its home. In a building that dates to 1883, the restaurant has a fun, bistro-like feel, great food and a thoughtfully chosen wine list. We always know we’ll find something new and interesting to sip there. We found Breggo when perusing the Pinots on the wine list, as we often order Pinot Noir when eating out since it goes great with just about everything— fish, pasta, beef and even dessert, by which I mean chocolate. I still remember the first whiff of its aroma— full of bold fruit and literally intoxicating. I’m not kidding…this wine grabbed us both by the nose and didn’t let go! When we tasted it, we looked at each other and beamed. Needless to say the wine was pure bliss as it opened up and paired perfectly with the food, one of us having a pan seared sea bass and the other a braised short-rib, if memory serves correctly. Breggo has that classic Anderson Valley big fruit flavor delivered with just the right dose of restraint, and is silky and smooth on the palate from front to back. We savored every drop with the meal and vowed to stop by the winery on our next visit. 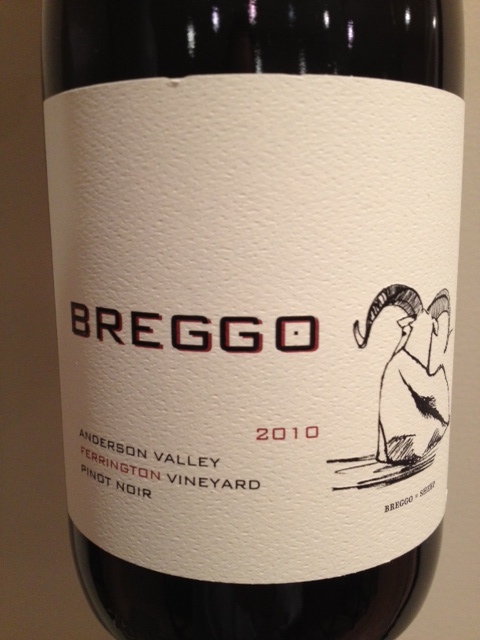 Breggo is a relative newcomer to Anderson Valley, having started in 2005. Ryan Hodgins has been the winemaker from the beginning. Hodgins got his Master’s degree from the UC Davis Viticulture and Enology program and worked at Hanzell Vineyards in Sonoma as the Assistant Winemaker prior to Breggo. Hodgins has said that the foundation of his winemaking is in acquiring the best fruit available in Anderson Valley and establishing long-standing relationships with growers. Cliff Lede Vineyards of Napa Valley Stags Leap fame acquired Breggo in 2009. Cliff Lede produces classic, high end Napa Cabs and blends and from what we can tell the goal with the Breggo acquisition is to produce equally great wines. Robert Parker called Breggo “an impressive, up and coming operation in the Anderson Valley.” The winery’s current releases include several whites (Gewurztraminer, Pinot Gris, Riesling and Chard) in addition to their famed Pinot Noirs, which include their signature Anderson Valley Pinot as well as their vineyard designate Pinots from the Donnelly Creek, Ferrington and Savoy Vineyards, all located in The Valley. They also make a Syrah which we can’t wait to try. Though we haven’t yet made it to the winery in person, we recently joined Breggo’s wine club and were giddy when our first shipment arrived. We have a tradition to open one bottle from every wine shipment right away to “taste the goods” so to speak before we store the remainder in our basement wine cellar. I know there may be purists among you who are shuddering at the thought that we are not allowing the bottle to recover from the “bottle shock” of shipping, but that’s just how we roll. The “first bottle” honors from our first Breggo shipment went to the 2010 Ferrington Vineyard Pinot, which did not disappoint. A rich, dark cherry color, floral and rose aromas on the nose and tart, ripe cherry flavors throughout. The wine received a 91 point rating from Wine Spectator and we are in complete agreement. This wine is lights out! So this week, we toast to the Treasures of The Valley we so love, to Date Nights that lead to such Treasures, to the legend of Mick Jagger and Mr. Jimmy, and to the good folks at Breggo Cellars. And though you can’t always get what you want, if you try sometimes, you just might find you get what you need. Thanks for the report on Breggo, I always enjoy hearing the backstory. Also, nice to hear of another Midwesterner unafraid to order/join a mailing list prior to the actual winery visit. I had the opportunity to meet Ryan Hodgins at North Loop last year when he was in town for a “meet the winemaker” visit. Nice guy! Jeff, fun to hear about your meeting Hodgins at the at North Loop event. Have to confess we are shamelessly liberal in joining wine clubs— when the wine is good, what more criteria do we need? : ) Nice to know Hodgins is such a nice guy. Cheers!